" We need to build up society in the light of the Beatitudes, walking towards the Kingdom with the least among us." Franciscan Voice Canada's Action section aims to help us be informed on matters relating to Justice, Peace and Integrity of Creation (JPIC) so that we can make choices to act and to encourage the changes we expect to see in the world. Action Alerts: These include petitions from Advocacy organizations working on behalf of those whose voices need to be heard. You are free to choose how and when to act according to your Franciscan values. Pope Francis: We include media that references Pope Francis' stance on areas of concern to JPIC. Franciscans International: As the Franciscan Advocacy group with a seat at the UN, we include Franciscan International progress and success stories plus link to the Franciscan Voice newsletter as it is published. News formerly a part of this section has been moved to it's own page called News. Where in the world does this issue arise? When did the issue arise? What are the causes of the situation? What can be done to remedy the situation? What is the Church’s position on the topic? "Christian love leads to denunciation, proposals and a commitment to cultural and social projects; it prompts positive activity that inspires all who sincerely have the good of man at heart to make their contribution." AN INTEGRAL AND SOLIDARY HUMANISM, a. At the dawn of the Third Millennium, 6. 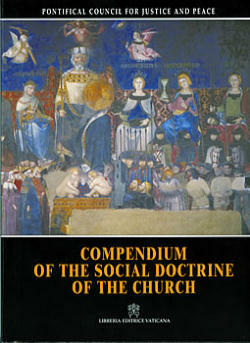 Compendium of the Social Doctrine of the Church. The COMPENDIUM OF THE SOCIAL DOCTRINE OF THE CHURCH presents the valuable foundations of Catholic Social Doctrine "as food for human and spiritual growth, for individuals and communities alike." It places the human person and society in relationship with the Gospel - the "Good News" of salvation, love, justice and peace for all and the whole person. It recognizes that moral values underpin natural law which form our conscience. "The document is presented as an instrument for the moral and pastoral discernment of the complex events that mark our time; as a guide to inspire, at the individual and collective levels, attitudes and choices that will permit all people to look to the future with greater trust and hope; as an aid for the faithful concerning the Church's teaching in the area of social morality." It extends an inclusive invitation to "all people to do all they can to bring about an authentic civilization oriented ever more towards integral human development in solidarity." "The Christian knows that in the social doctrine of the Church can be found the principles for reflection, the criteria for judgment and the directives for action which are the starting point for the promotion of an integral and solidary humanism." Human Dignity and Freedom - This principle is the foundation of all the other principles. We are made in the image and likeness of God, loved unconditionally by Him. So, authentically living our God-given dignity and enabling others to live theirs glorifies God. Truly loving, as God does, is transforming. The Common Good - This principle teaches that the goods of the world are gifts to be shared rather than things to be possessed. Working towards the Common Good means making choices that are the most beneficial for all the people involved. The essential elements of the Common Good include: respect for persons, social development and well-being, and peace. Subsidiarity - Recognizing that we are in inter-relationship with others in society, this principle expects that every social activity ought of its very nature to furnish help to the members of the body social, and never destroy and absorb them. Subsidiarity is understood as the State providing economic, institutional or juridical assistance where required and never doing anything that would restrict initiative, freedom and responsibility. Solidarity - Recognizing our inter-dependance as one human family, the social principle of solidarity, is a moral and ethical virtue, "a firm and persevering determination to commit oneself to the common good" because we are all of us responsible for all, the living image of God made man. Peace is the fruit of solidarity. Truth - We have a duty to respect truth and bear responsible witness to it. Freedom - recognizes that we are made in the image and likeness of God, our essential human dignity. “Far from being achieved in total self-sufficiency and the absence of relationships, freedom only truly exists where reciprocal bonds, governed by truth and justice, link people to one another” without losing ourselves. It is also our capacity to refuse what is morally negative. Justice - "consists in the constant and firm will to give their due to God and neighbour.” What is just is determined by the profound identity of the human being. Justice itself is only enough when inspired by the deeper power of the saving love of Jesus.